I managed to fix this problem by googling. 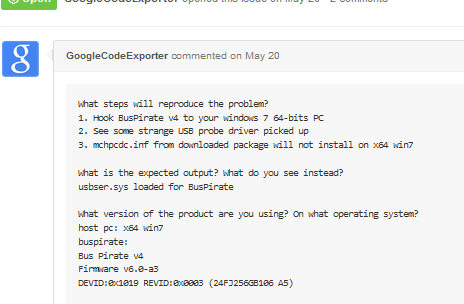 All I did was changing VID and PID to what I have in Bus Pirate and then naming it nicely at the end of INF. Voila! I was able to update driver software. This entry was posted on Friday, September 4th, 2015 at 3:47 pm	and is filed under BP v4. You can follow any responses to this entry through the RSS 2.0 feed. You can skip to the end and leave a response. Pinging is currently not allowed.